News that a very fragile domestic violence survivor who struggled with some aspects of the workshop courageously made it through the event with gentle encouragement right throughout from one of TC’s Pink Belt assistants. And on top of that, the participant left feeling empowered. 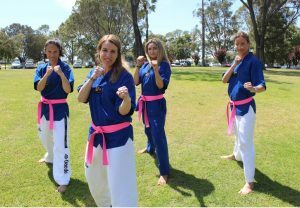 A complete stranger slipped me a $200 donation towards fundraising for the Pink Belt Scholarship project asking that her generous contribution remain anonymous. 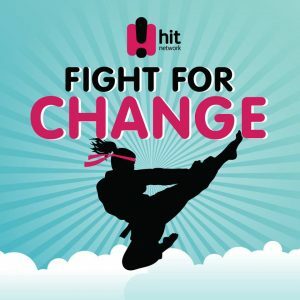 Word from Juelz later in the day that feedback coming in from the other four locations around WA where Fight for Change events were held was also very positive. The buzz afterwards in knowing that together as a club we had been involved in something meaningful that would trigger a stunning ripple effect for others. 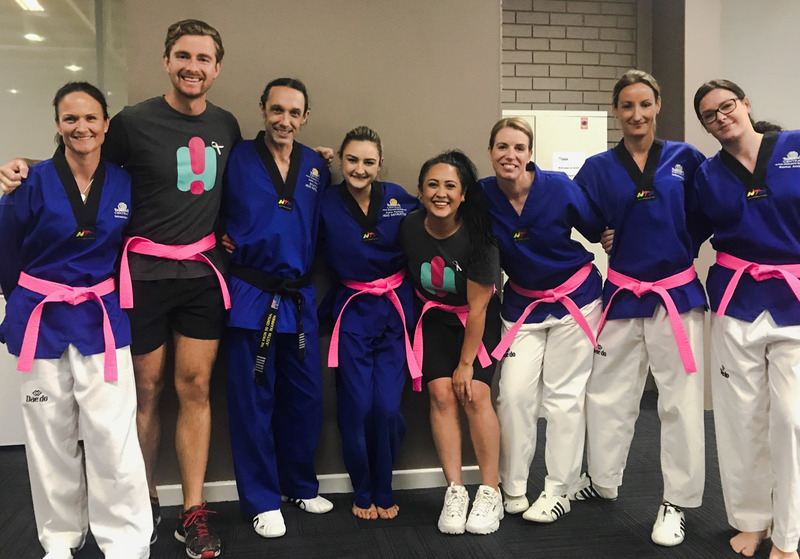 A big bunch of participants expressing interest in continuing their training through Counterstrike, Taekwondo Central or MartialFit. 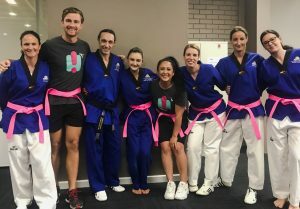 The group of my Taekwondo sisters who all turned up wearing Pink Belts to support the event and support my project still gives me tears when I think about it days later. Even the amazing but always humble Ajana who tossed aside her 4th Dan Black Belt in favour of pink for the day! The very nature of a project like Pink Belt Scholarships demands a person out front and as uncomfortable as I am in that role, I have been able to do it ONLY because of the people in my club who have stood behind me propping me up the whole way. Well done to you Kristy, Juelz and Jesse for hatching and executing this brilliant plan, and good on the instructors and members of your club who were able to support the great event! As you know, I am a firm believer in the ripple effect and it always impresses me when I see special people invest the effort it takes to cast a stone. Congratulations to the women who bravely got involved and learned some empowering skills of personal protection.